Illustration for an article about the tallest White Pine recorded. It was saved from the saw by a young boy who fought to preserve it. 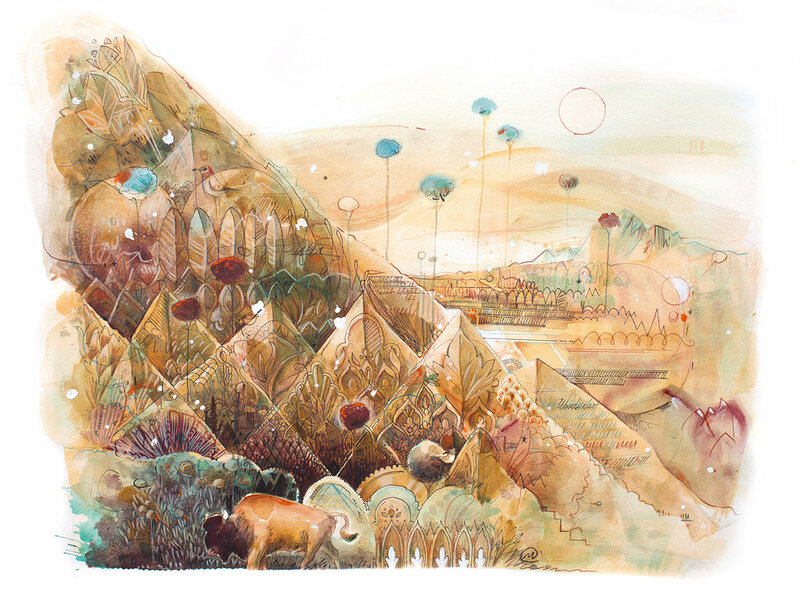 Album art for Minneapolis-based singer/songwriter Jillian Rae. One of Five in a series of illustrated destinations throughout Australia, New Zealand and Alaska for a west-coast cruise line's marketing catalog. A fictitious (although probable) rendering I made to illustrate the evolution of popular snacks. One of many renderings for a collaboration with General Mills to illustrate the baffling, yet very real world of compulsions tied to the food we eat. Editorial illustration placing the Twin Cities' top Fortune 500 companies in proximity for review. Landscape illustration simply showcasing Spain's wealth in architectural aesthetic. A personal piece most likely painted during the cold months... dreaming of casting a fly to picky trout. Illo for an article about awareness for services to treat chemical dependency and thusly curb suicide rates among attorneys across the United States. Client: American Bar Association Magazine - "Litigation"
I was asked to render a disastrous trail of mud after an adventurous run. Now that I have kids, I look back on this as only a minor incursion. 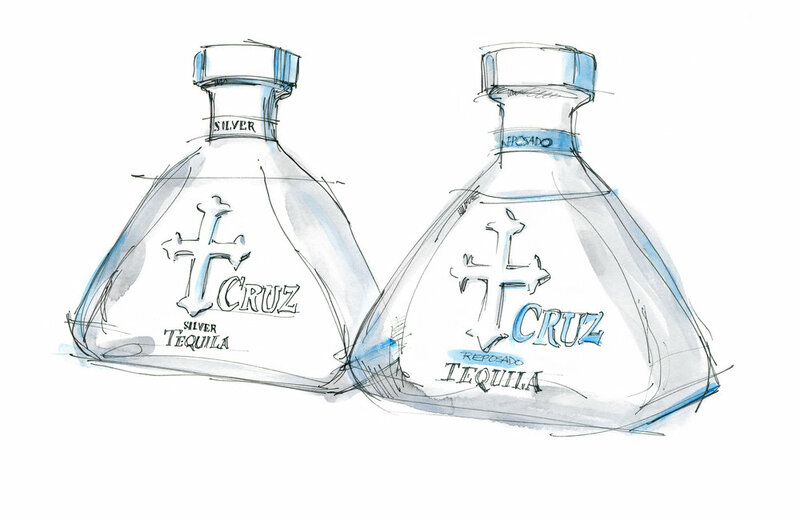 From a series of illos for a marketing package for Cruz tequilla. Talks arose quickly of where to put the monolithic amount of dirt displaced by Seattle's "big dig". 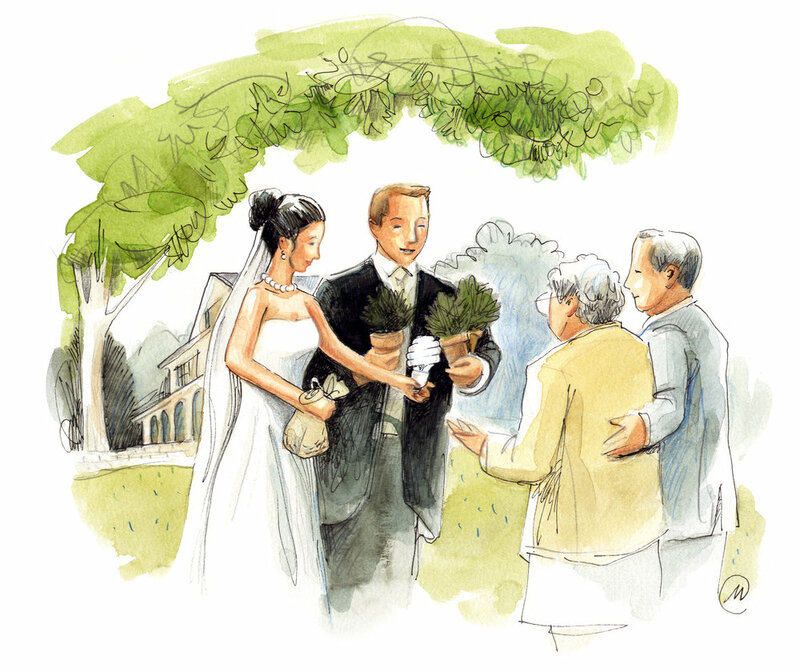 Readers were asked for their creative solutions and I got to illustrate them. One of several illustrations for Golden Shovel Agency. GSA brings creative energy to the work of economic development. They’ve helped more than 140 communities across North America to shape and tell their stories in order to strengthen the vitality of their regional economies. Their core services include branding, marketing, strategy, web development, and online communications. One of several illustrations for Golden Shovel Agency. GS brings creative energy to the work of economic development. They’ve helped more than 140 communities across North America to shape and tell their stories in order to strengthen the vitality of their regional economies. Their core services include branding, marketing, strategy, web development, and online communications. Spot illustration for a brochure and map highlighting characteristic features of Portland, Oregon's Classical Chinese garden. Illustration for Mainline Today's back page "End of the Line" story of a star-crossed runner and his misadventures of an off-road run. Concept illustrations for a startup tax service company offering more convenient, secure and mobile tax prep options for its clients. Series of illustrations for Seattle Magazine featuring key icons in the tapestry of Seattle's rich history. 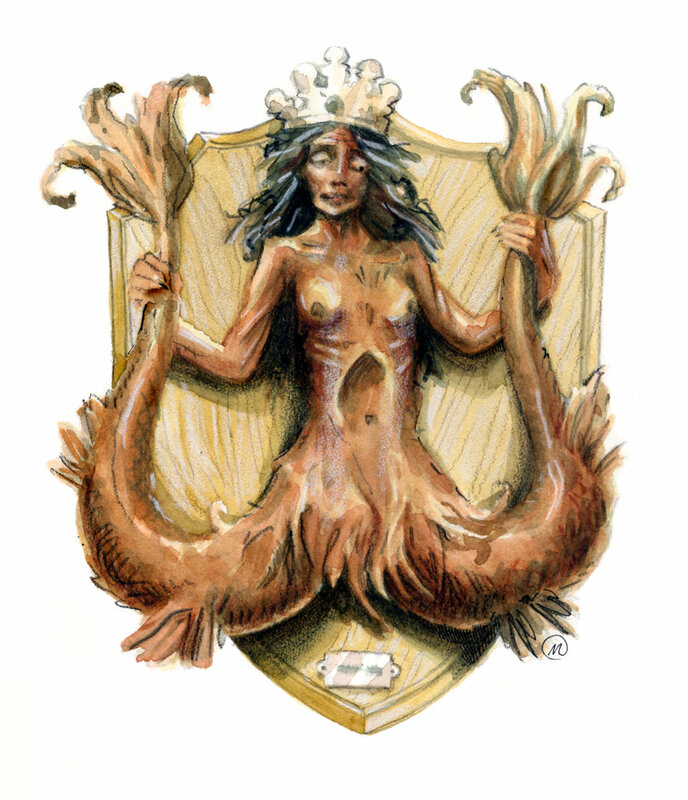 Shown here is an imagining of Starbuck's Coffee's iconic mermaid. Illustration for 'the Wall Street Journal Euro' publication rating seasonal summer wines. Weekly spots for an editorial revealing the science of wine and also reviewing trends in wine consumption and collecting. Rejected concept sketch for an educational kiosk near archaeologically significant locations around Las Vegas, Nevada. Half-page illo for a local special interests magazine. Historical renderings of early undersea hunters for classroom guide. Spot illustration for Ode Magazine. 1/4 illo to accompany an article by Paulo Coelho for Ode Magazine. 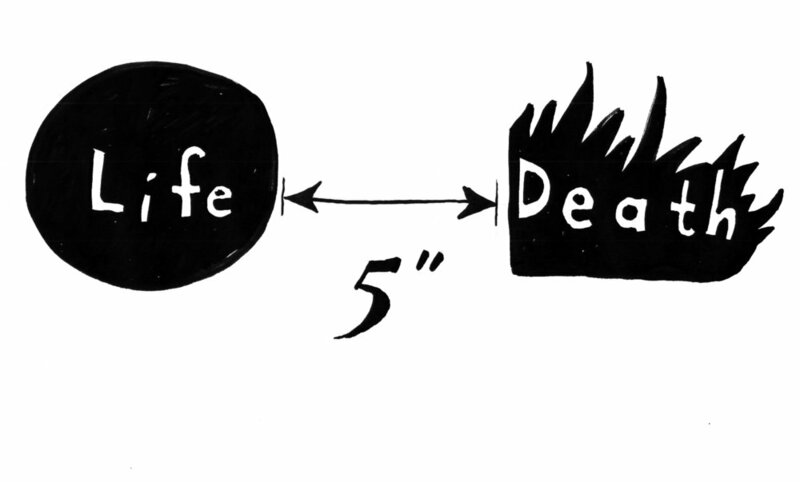 Quick spot illustrations for an article about the tenuous existence inside of war. Quick spots for a local special interests and events publication. Quick spots for a local special interests, arts and events publication. Illustration for a local special interests, arts and events publication. Illustration highlighting the prevalence of distracted driving.